It's a good time of year to notice the large yellow blossoms of common evening primrose. They have long spurs and a cross-shaped stigma (female flower part) in the center. These flowers open at night to be pollinated by moths, but at this time of year they often last much of the next day as well. Along September roadsides and in dry fields, the lemon yellow flowers of a night-blooming native wildflower seem suddenly more eye-catching than they were earlier in the summer. 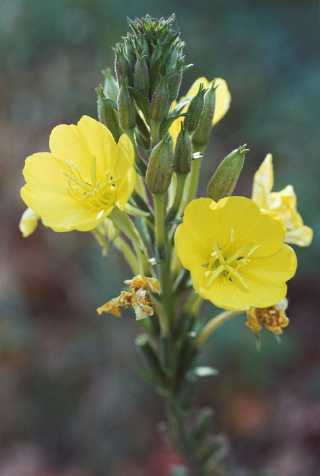 Common evening primrose (Oenothera biennis) has tall leafy stalks with flowers that open in late afternoon or evening. Its yellow blossoms typically last into the next morning but wilt in the midday summer sun. But now that it's autumn and the season's sunlight is less strong, the evening blossoms are lasting longer and we have more opportunities to notice them. Sometimes they stay most of the day. Why would a plant bloom at night? Common evening primrose does so because it is pollinated by moths. We're likely to think of moths as going after the porch light, not pollinating flowers, but some moths are important pollinators. Common evening primrose is often pollinated by moths in the sphinx or hawk moth family (Sphingidae). Sphinx moths have long tongues that can reach the nectar deep in the large flowers. They also have keen color vision that serves them well in very low light. The yellow flowers of common evening primrose also have patterns that are visible to moths and other insects but not to us. To see the patterns, we'd need to look at them under ultraviolet light. If you want to see how an evening primrose flower looks in ultraviolet light, go to http://www.naturfotograf.com/UV_OENO_BIE.html. The photo shows a flower that's white with red lines swirling toward a red center. These patterns serve as honeyguides, pointing to where nectar can be found. The flowers of common evening primrose can be quite fragrant, although their scent isn't always noticeable to us. Their fragrance helps moths find them at night. Look for common evening primrose in sunny places with sandy soil. You're likely to notice it at the sides of Westborough's roads as you drive around town and at the edges of parking lots. Its roots store water, helping it to survive in sandy areas. Common evening primrose is found coast to coast. This native plant was brought to Europe by the early 1600s for its food value. The plant is a biennial, blooming and then dying in its second year, but the roots are full of stored carbohydrates at the end of the first year. People boiled and ate the first-year roots like parsnips. The young shoots were also used in salads. The plant now grows wild in England and parts of Europe, Africa, and South America. Seeds of common evening primrose are a popular food with birds. Seed capsules ripen on lower parts of the plant, filled with small black seeds, even as the last blossoms open at the very top of the stalk. During the winter, the sturdy dried plants stick out of the snow, keeping the nutritious seeds within easy reach. For people, the seeds provide oil that is the basis for evening primrose oil, which is sold commercially as a food supplement in this country and prescribed as a medicine in some European countries. It has been used to treat a wide variety of conditions, from breast pain to asthma. It is approved in several countries outside the U.S. for the treatment of skin ailments such as eczema and atopic dermatitis. Medicinal uses of common evening primrose go back to the Native Americans. They drank root tea for obesity and bowel pain and used leaves in warm wet dressings for bruises. In spite of its name, common evening primrose is not closely related to primroses or roses.